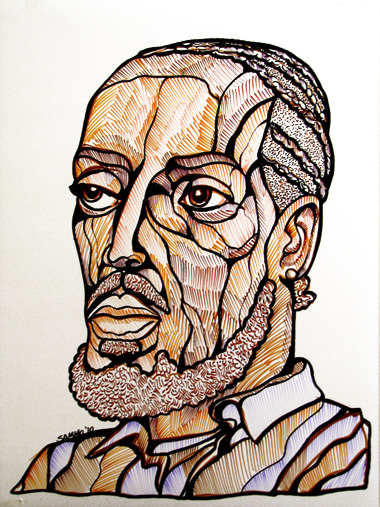 This is a somewhat sloppy marker sketch of Omar Little from the HBO TV series "The Wire". For anyone who hasn't seen "The Wire", the TV Show is widely considered (by critics and the public) to be the best and most realistic TV show ever created. It basically tells the story of Baltimore's illegal drug trade from the perspectives of law enforcement, drug dealers, educators, politicians and the media. I admit, As I watched the entire 6 seasons over the holidays I struggled to understand why it was considered the best TV show ever. The plots are intricate and the characters were so flawed that I couldn't find anyone to root for. Ironically, the only character I really identified with was Omar Little, whose occupation was robbing drug dealers. Hardly a good guy, but he seemed to be the only character with a code of "ethics". Anyway, I've had a full month to absorb the series (and its intricacies) and can honestly say not a day goes by that I don't think about that show and its message(s). It's definitely made an impact on me. I'm actually prepared to admit it really is the best TV show ever created. It's had a profound affect on how I view the world that I'm still trying to grasp. Anyway, for anyone thinking about watching the series be prepared, it's gritty, violent, provocative and disturbing. It's also unlike any TV show or movie you've ever seen. It's actually so uniquely different that it will ruin other TV shows you may have liked previously. That's not just me talking... other reviewers have claimed the same thing.